Suitably Stamped: Project Life & Stampin' Up! I'm absolutely GIDDY about the news from SU! today. Stampin' Up! and Project Life, created by Becky Higgins, are joining together to make the scrapbooking "magic" happen. Are you a scrapbooker? 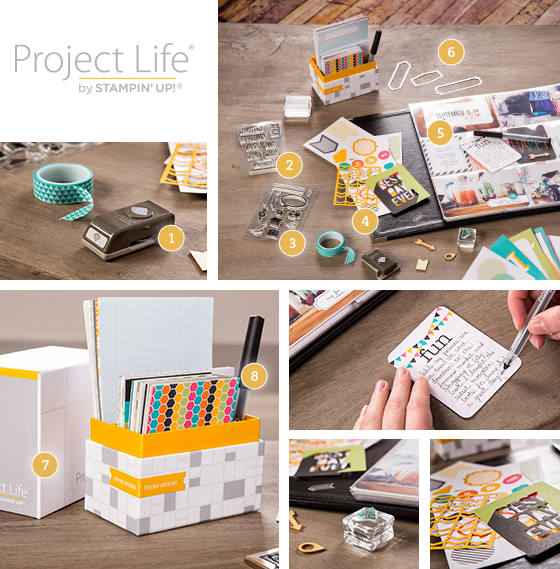 Have you tried Project Life? Let me tell ya....it's awesome and having the exclusive Project Life designs that coordinate with the exclusive colors of Stampin' Up!...THAT is definitely magical. What a perfect partnership. If you're like me and you have boxes upon boxes of photos that you've intended to get in to scrapbooks for the past several (or even more) years, Project Life is an incredible way to get your memories into fun and easy to create keepsakes that will be treasured for years to come. These products will be available very soon and I'll be sitting at my computer ready to roll on April 21st when the preorder items will be available to all SU! demonstrators. I cant WAIT! Now is a great time to get a no obligation starter kit so that YOU can preorder yours at up to 30% on Monday April 21st. Our No Obligation Starter kit includes $125 in product of your choice for $99 with FREE shipping. Be a part of my team by Monday and you'll be able to also get first dibs on the retiring items that will be announced and get an additional 30% off of that order too. I have "Welcome Packets" and fun treats ready to mail out to everyone who joins the fun. I'd love to send one to you.